From a Drum Corps Europe (DCE) press release: The DCE European Championships will be held in the Netherlands at Sparta Rotterdam Stadium for the third consecutive year. The event will take place on Sept. 29. "We are delighted to be in Rotterdam again," said DCE Chairman Marcel Matthijsse. "We are pleased with our collaboration with Sparta and the stadium meets all our requirements. 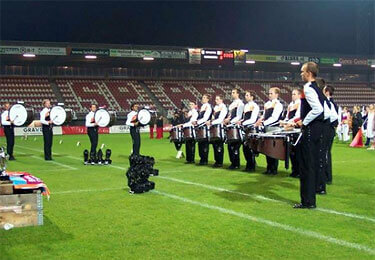 Drum corps is becoming better known in Rotterdam and we are being discovered by an increasing number of people." 2006 DCE Championship finale at Sparta Stadium. For this new edition, DCE and Sparta have created their first "emergency plan." In the event of heavy rainfall, the prelims competition will be played toward the rear stands. This will prevent constant use of the same part of the field during the whole day. Last year, the DCE Championships attracted more than 2,000 spectators to Rotterdam. Find more information about Drum Corps Europe and the 2007 DCE European Championships at www.drumcorpseurope.org.